Fisheries workers with the Kentucky Department of Fish and Wildlife Resources caught this muskellunge for hatchery broodstock from the Licking River just below Cave Run Lake earlier this month. FRANKFORT, Ky. – The weather can be erratic and water levels can fluctuate wildly, but spring brings with it some of the best muskellunge fishing of the year. Anglers looking to tangle with a big muskie are fortunate to have an abundance of options in Kentucky – from Cave Run, Buckhorn and Green River lakes and their tailwaters to native muskie streams like the Licking River along with Tygarts and Kinniconick creeks. Not having a boat doesn’t mean you have to sit idly during this active time. Cave Run and the area surrounding it make for an ideal early spring destination for the enterprising bank angler. The 8,270-acre reservoir was created by damming the Licking River and reaches into Bath, Rowan, Menifee and Morgan counties. Regarded as the state’s top muskellunge fishery, it yielded the current state record muskellunge in November 2008 – a 54-inch, 47-pound behemoth caught by Sarah Terry. 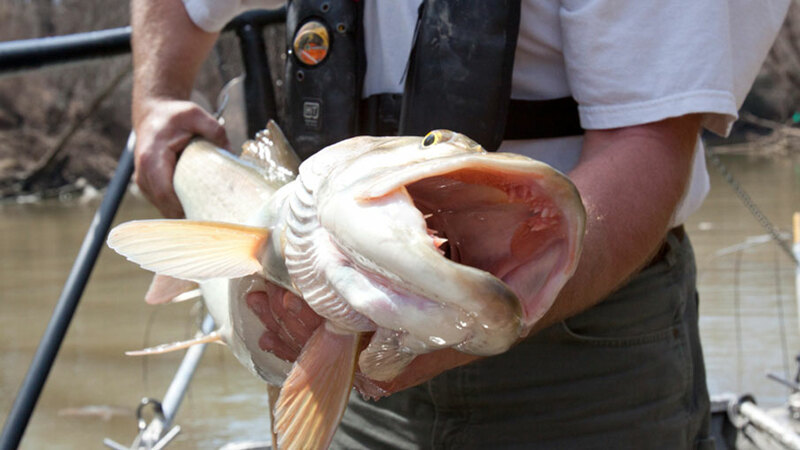 The Kentucky Department of Fish and Wildlife Resources helps maintain the population by stocking about 2,800 13-inch muskellunge into the lake each year. The fish are reared at the nearby Minor Clark Fish Hatchery. As pre-spawn muskies seek their preferred water temperatures in the spring, they stage in the tailwaters below dams and move into creeks or find shallow coves that warm quickly during the daytime. The Stoney Cove Recreation Area is tucked in a corner along the lake-side face of the Cave Run dam and like the tailwater area on the other side of Ky. 826 is popular among bank fisherman. “They catch all kinds of them from the shore there,” Mullins said. The area around a culvert extending under Ky. 1274 near Longbow Marina on the southern end of the lake in Menifee County is another spot known to produce quality fish. Weed growth on the main lake has created habitat that anglers can work from shore. “Muskies like being in those weeds,” Mullins said. Tailwaters can be phenomenal for spring muskies. One afternoon earlier this month, a three-man crew from the hatchery loaded into an electrofishing boat and set out in search of muskie broodstock from the tailwaters below Cave Run’s dam. The crew encountered slack water and shallow running conditions, limiting the search area to about 300 yards downstream from the ramp, but wound up netting eight muskies in short order. The largest was a 49-1/4 inch female. The fish will be returned to the area where they were collected after breeding at the hatchery. Lake level and outflow information for Cave Run Lake can be found online via the Louisville District of the U.S. Army Corps of Engineers’ webpage at www.lrl.usace.army.mil. An ideal water level below the dam ranges from 1,000 to 2,000 cubic feet per second. “From a bank fisherman’s standpoint, and from a fishing standpoint, when that river gets up a little bit it allows the water to go back into the little coves around the tailwaters, which enables people to fish that area better,” Howes said. Mike Hardin grew up in the area and has fished the lake and Licking River since childhood. Licking River tributaries like Triplett Creek should not be overlooked, he said. “Look for a warm rain event,” said Hardin, an assistant fisheries director for Kentucky Fish and Wildlife. “The muskies will go back into the creeks as the water warms up closer to the 50s.”Lure selection is not drastically different for bank fisherman targeting muskies.Minnow lures or twitch baits and 1-ounce spinnerbaits with two single hooks work well in the spring. As the water warms, top-water baits can entice a curious muskie into striking. “You need to fish a lure that’s not going to hang up a lot,” Mullins said. Quick-strike rigging with live suckers or bluegill is another option. The tandem-hook system aims to reduce mortality rates for catch-and-release muskie by eliminating the need for anglers to wait for the fish to swallow the bait whole. Anglers are reminded to get permission from a land owner before entering or crossing private property to fish. A fishing license is also important. The new license year started March 1.Fishing licenses are sold through a variety of outlets. Vendor locations are available on the department’s website at fw.ky.gov. Licenses and permits also can be purchased online or by calling (877) 598-2401. The Kentucky Fishing and Boating Guide provides complete licensing information and is available online and wherever licenses are sold.